How To Be An Instant Celebrity? You do what Stefanie Gordon did yesterday on her Delta flight from New York City (LGA) to West Palm Beach (PBI) and takes several photos of the Space Shuttle Endeavor's last lift off from Kennedy Space Center (KSC). That single action did not gain Stefanie her celebrity status but what she did when she got to West Palm Beach did. After getting onto the Delta flight in LaGuardia (LGA) she sent her last tweet and turned off her iPhone 3GS, because she decided not to pay for in-flight WiFi, and then proceed to sleep through most of it. Until the plane began its decent to Palm Beach International Airport (PBI) and the pilot came on announcing the Space Shuttle Endeavor has just lifted off KSC. When Stefanie landed and got to a WiFi hotspot she sent the following tweet. This tweet and the photos she took were picked up by local and national media within minutes, resulting in numerous telephone interviews. The media even interviewed her father before she made it to her parents' home from the airport. Stefanie's Twitter account gain over 2500+ followers within one day. This surely demonstrates the power of social media. You can see some of the photos fellow Flickr community members; including Stefanie's (brand new Flickr account), took of the historic flight. At this very moment there are quite a few major conflicts happening, most of it centered in the Northern part of the African continent. The areas marked in red are active conflicts with daily escalating changes, where as the areas marked in pink are on going conflicts that have yet to be resolve, but the situations are somewhat stable. The recent March 11th triple disasters in Japan have drawn much of our attentions away from these conflicts. We shall use this recent disaster to remind us how fragile we are? We shall focus on killing each other but focus our efforts on the environmental effects we're causing in our habitat. If we do not take care of this Earth we live on, mother nature will eventually wipe us out. Cultures around the world have many differences, among those are the phrases used to describe everyday things. For example, Canadians often call the poles on the side of the road supporting electric cables, "Hydro poles". In other parts of the world these will be referred to as "electric poles". British people refer to long cushioned chair normally placed in the living room as "chesterfield", but most other cultures refer to it as a "sofa". The most famous difference is the way North Americans refer to American football as "football", where rest of the world use this term to refer to soccer. Having been to Japan and recently returned from Sapporo. I notice a great deal of differences between Japanese culture and the rest of the world. Please note that I am generalizing and stereotyping based on my own observations. I also understands that there are exceptions in all cases about to be described. There are a general conscious and awareness of the environment and self actions effecting the ecosystem. The Japanese takes great pride in recycling. At a public food fare in Sapporo during the Snow Festival, I notice at each disposal locations are three separate bins to receive the garbage. One with a ladle to receive the liquid and collect any garbage that may exist within the liquid. There was one to collect all styrofoam containers. The third collect all others. 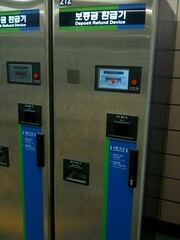 Some stations even have someone stand by, in case foreigners do not know how to separate the garbages. Later on in the evening these dispose collectors were overflowing but everyone still kept with the separation process and not a single piece fell to the ground, or separated incorrectly. These dedication to the environment, determination and care for the workers down the processing line who will have to manage these waste is second to none that I can see. I can imagine it happening in North America or Europe, but it will take only one bad apple to mess the who process up. I definitely cannot imagine this is possible any place where Chinese are the dominate culture, especially mainland Chinese. Strangely, even with this awareness of the environment and recycling, the Japanese are the worst culture in terms of exploiting the sea for food. The problem with Japanese whaling, seal hunting and other form of hunting for food at sea, is a big problem throughout the open waters ("international ocean territories"). Of course Japanese are not the only ones exploiting the sea without concerns of the outcome, they are just the most contradictory. Another difference Japanese culture has over others is their attention to details. Not only are washrooms in Japan extremely clean. I noticed during one of my visit to a washroom at the airport, they have hooks between the urinals in additional to a counter above, to allow people to hang and place their belongings as they perform their business. It is a bit hard to see the hook in the photo but I had to take the picture quickly for obvious reasons, but you can also notice that the urinals are set far apart to offer privacy. The other neat feature I found was in the washroom of my budget hotel room. One side of the wall had a full width mirror and after a hot shower I notice it had an anti-fog feature. It was not the entire length of the mirror but just a section large enough for the average person to see themselves in. I believe these attention to detail is how Japanese companies recovered from the war and pulled ahead of their international competitors for so many years. Each culture has much to learn from the others. I just which they can choose the correct traits to imitate. 喜喜For the Chinese there are auspicious days within a year for weddings. Choosing the right date for a couple, one needs to take into account the Chinese Zodiac signs for both bride and groom. Choosing the right date will mean good luck for the couple and their respective families. Below are the auspicious dates for 2011, the Lunar year of the rabbit. This list is provided here only as a guide. You will need to seek an expert to find the correct date for you and your partner. Remember when determining your correct Chinese Zodiac sign, you need to know the official start of Spring (立春) for that year (start of Tiger month); this can be different every year. Most Chinese Zodiac websites only specify the Lunar New Year day (around January or February in the Georgian calendar) but they do not take into account the first day of Spring. Doing so will determine the Chinese Zodiac sign for your birthday rather than birth year. httpv://www.youtube.com/watch?v=0ebckRNly_QAt Pacific Coffee this morning I observed a boy; about the age of ten, at an Internet workstation. From the start I see that he is fidgety, and is the type who cannot sit still. When he jumps onto the computer the first thing he does is sign into Facebook. He scans the posts in his Home stream, then proceeds to FishVille for the next 15 minutes. Throughout his time on the computer I see that he is still fidgety and cannot sit still, but he is able to endure this urge and stay put for FishVille. It is quite interesting how Zynga is able to create games that are addictive to both young and old, but I will leave that for another post. What worries me is that there is no signs of his parents. I hope they have taught him the basics of information sharing on The Net and it's dangers. Please don't get me wrong. I am all for our young generations embracing technologies, but they need to be first educated on the dangers and importance of personal privacy before jumping in head first. This is particularly important given the recent revamp of Facebook's privacy settings for it's user accounts. I think there needs to be some basic education for everyone who use the Net, no matter at what age. I am definitely not speaking for the monitoring of The Net or filtering The Net access for the end users. The two extremes in this being China and Australia. It is impossible for any governing body to determine all dangerous or inappropriate contents and activities, which exist today and in the future. Also who is to say what is dangerous and what is appropriate. The society should determine that. It is much more practical to educate the users, empower them to make those decisions, and allow them to act accordingly to protect themselves. Always explicitly log off any web site or services instead of just closing the web browser. Never opens/clicks on links directly within emails. Try to locate the referenced content yourself on the said web site or retype the URL yourself in your web browser. Pay attention to any hyperlinks (URLs) that may be trying to spoof the site it is pretending to be. Do not click or download any attachments from anyone; even from people you know, unless that person had previously told you he will send you an attachment. Before you share any information (content) onto the Internet, you should stop for a moment and think whether you are willing to have this content permanently stored/live on the Internet. I hope you find these information useful and you will share them with as many people as possible, especially young children. While in Shanghai for the World Expo 2010 the following are sites that I cannot access. My Posterous Site - although I can send posts to my Posterous site via email, I cannot see how these posts appear on the site as I cannot load it. Facebook - I have several comments I like to reply to on my Facebook Wall, but I cannot log into Facebook to do so. Twitter - as I had mentioned in my post Internet Deprived in Shanghai, I cannot access any Twitter services or related sites. FriendFeed - I cannot post anything to FriendFeed because the entire site is block. This may be because it is now own by Facebook. YouTube - I cannot see any videos on YouTube referenced by articles/posts I read. Therefore missing much of the content of a post. This lack of access also eliminate my sharing of interesting videos found on YouTube. Without the above makes it hard for me to share. Fortunately, I still have Google Buzz and Google Reader. On January 12, 2010 a magnitude 7M earthquake occurred in Haiti. Many countries immediately sent humanitarian aids and rescue team to the devastated country where over 80% of the buildings are destroyed. Most of these countries air lifted aids to Haiti but the airport was not reopened until late that evening. Instead of doing what other countries do, USA sent their Nimitz class supercarrierUSS Carl Vinson to Haiti. It brought with it humanitarian aids, search and rescue, but instead of bringing fresh water to Haiti. The US used the carrier's ability to produce fresh water to create 300,000 liters on location. Yes, this sending a USS carrier is impressive and it also has the infrastructure necessary to assist the wounded, like shelter and field hospital, but a more cost effective way would be for United Nation, UNHCR and other national agencies to invest in local purification systems, like LifeSaver invented by Michael W. Pritchard. According to Pritchard it only cost GBP4.00 per person. I like to share with my readers the process in which I became a SSD ("Sold State Drive") user. The price of SSD drive is still way more expensive than a regular HDD, especially when you compared the cost per GB (Gigabyte). In Hong Kong on average one can find a reasonably fast 7200rpm 1TB (Terabyte) 3.5" internal drive for about HKD790.00. Even if you purchase a USB capable external enclosure that is only an additional HKD120.00. Giving you a cost per GB of HKD0.91/GB. On the other hand the Intel SSD X25-M 160GB cost me HKD3770 at the beginning of January, giving me the cost per GB of HK23.56/GB. This means using a SSD cost 24.89 times more. How I come to decide on purchasing the Intel SSD X25-M? Partially it is because of the reviews and information gather from AnandTech's web site, plus the feedback from various people about Intel and OCZ SSD. The reason I compared the 2.5" SATA II SSD internal drive to a Western Digital Caviar Black 3.5" high performance SATA II drive, is because that's what I would have purchased as an additional drive for my MacBook Pro. Now that I purchased the SSD, I converted the original 320GB drive into an external backup drive with an external enclosure. So is the 160GB SSD installed in my 2.66GHz MacBook Pro 15" (Mid 2009) with 4GB of RAM 25.89 times faster than when I had the original 320GB 5400rpm HDD installed? I use the program XBench 1.3 to test my MacBook Pro prior to and after swapping the new SSD for the HDD. The following are the summary of the scores. These results show that my MacBook Pro improved its overall XBench score by 1.64 times and its disk performance score by 7.91 times. Due to Write Amplification I believe more RAM will help further improve the overall performance of my MacBook Pro. Early this year both PCCW and CSL launched their HSPA+ network. As a result improving the speed and capacity of their respective networks. Offering a theoretical downlink speed of 21Mbps and uplink speed of 7Mbps. On Wednesday, November 4th Smartone-Vodafone (SMV) launched their HSPA+ upgrade to their 3G network. The difference between SMV's announcements and the others, is that SMV also released a document to clarify the theoretical speed of HSPA+. Where as other mobile carriers in Hong Kong and elsewhere in the world, only focused on marketing the HSPA+ networks' capability of 21Mbps speed, leaving the actual ability to achieve 21Mbps as small prints in their promotional materials. Such practices of these other mobile carriers are very misleading for layman consumers. I will attempt to explain further, to help clarify this theoretical speed of HSPA+ for layman consumers. The user be within a very close proximity to the cellular antenna; well within half the distance to the cell edge. There are no one else connected to the cellular antenna other than the user. The edge server of the carrier has no other users. The server hosting the web site has no other users accessing it. Lastly there are no other users using the connection between the mobile carrier's ISP and the web site in question. As you can see from the above it is impossible to achieve such a scenario in real life. In an effort for SMV to be transparent and honest to its customers they lay out the explanations for this theoretical speed in a web page on their web site, The truth about broadband speeds. I will give SMV HSPA+ network a try in the coming weeks and will report back after I do. In the mean time I have already noticed improvements on the SMV 3G data access speed in the recent days. This is most likely due to the additional capacity gained by the HSPA+ upgrade. I started off spending the morning planning my itinerary for the day. 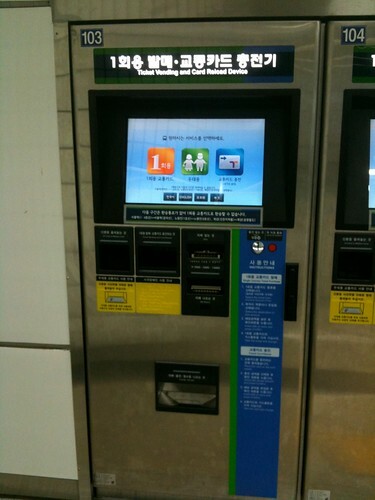 I have decided that I will use Seoul's extensive Metro (subway) to get around in the city. Did not end up leaving the hotel until 12:30. So I began by getting a bite to eat at a restaurant that I can figure out the menu, Burger King. Walked to Yeouido (526) station on Line 5 to begin my journey. Fortunately the ticket vending machine has English instructions. 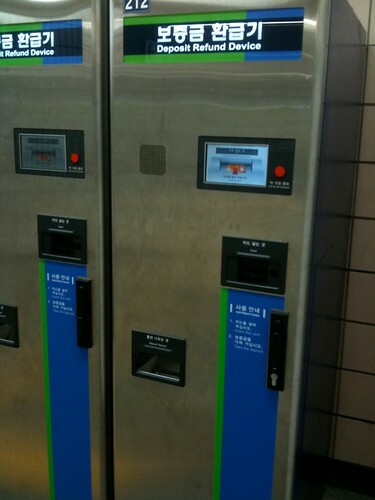 It was quite easy to get a ticket, although I did not realize there is a deposit to the Metro Single Journey card. 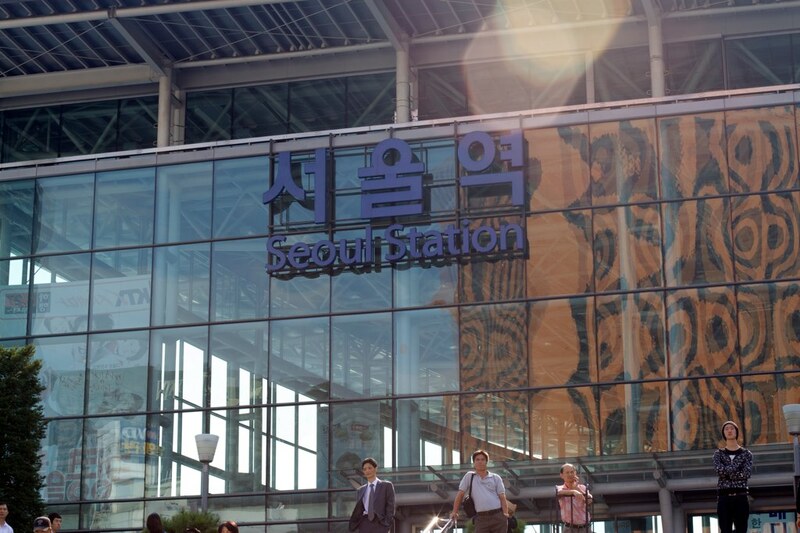 I figured that out when I reached my second stop Seoul Station. My first stop of the day was City Hall (132) on Line 1. Since it is the weekend I was going to check out City Square. Unfortunately when I arrived it was pouring rain. Everyone was stuck at the Metro exit waiting for the rain to stop. 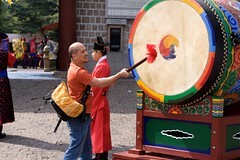 I decided to wait along with the locals at exit 2, the entrance to Deoksugung (Palace). Apparently most locals are like me, hates to carry an umbrella. All of a sudden a lady with a cart load of umbrellas came to the Metro exit, selling umbrellas for KRW4000 each. Since I was not in a hurry I decided to wait it out. Several minutes after the lady sold umbrellas to every locals waiting with me the rain stopped and sun even came out. I decided to do some people watching and photos of the palace entrance. There was an admission to get into the palace compound, so I decided to just hang out at the entrance. All of a sudden a palace staff started to clear the area in front of the entrance. Saying something about the changing of the guards. I had read about it in the guide book, but did not realize the ceremony was outside the palace. I was so lucky to get a great photo spot for the ceremony. A girl came up to me and started to explain what is about to happen at the entrance. Then she asked me if I like to ring the ceremonial drum for them to kick of the changing of the guards. I was so surprised so I accepted. She explained the details of what I needed to do, including the number of times, how hard and how fast I need to hit the drum. Another staff came out in ceremonial custom and handed me this huge stick. The new set of royal guards arrived at the palace entrance and were in attention waiting for me. The announcer let everyone know in Korean, English and Mandrin that I will be kicking off the changing of the guards. I then received the signal and began striking the drum with the huge stick they gave me. As soon as I made the first strike the crowd broke out in applauds. I had to do it three times and slowly. The crowd applauded after each strike. At the end of the third strike the royal band began to play and the ceremony officially began. What an experience for my first offical day on my first visit to Seoul and Korea. After the visit to City Hall area I had planned on walking down to Seoul Station to take some photos as it is supposed to be a historic building like Tokyo Station in Tokyo and Union Station in Toronto. So I began my journey, with the only guide being the compas in my iPhone 3GS. As I had forgotten to bring the detailed map, and there were no tourist signage of any kind, all other signage are in Korean. When I arrived at Seoul Station I found the station to be under renovations, with scarffolding all around the old building. This was disappointing plus I noticed the people hanging out around the station are fairly shaddy. Most of them were drunk, and there were drunken men and women. So it was time for my next stop. 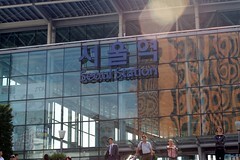 I had planned to visit the Daehagno area, which is supposed to be a mecca of Korean performing arts. With many improv performances in near by parks. As soon as I arrived at Hyehwa (420) on Line 4, exit 2, I found all sorts of people hanging out flyers to what appears to be live shows. Around the corner there is a crowd formed around a guitarist. He wad able to stir up the crowd but I had no idea what he was saying, but the crowd seems to find him funny. I continued down some side streets exploring the neigbourhood and found many outdoor cafes and restaurants. There was this main street where many vendors had set up shop selling jewlery, hats, scarfs, etc. There did not appear to be any issues with vendors setting up where ever they wish. As I saw large mini store like set ups in underground people tunnels to cross major intersections and Metros. The main street was where I sat for the past half hour people watching and writing this post.